Your message is in the process of being delivered. Demo reminders can only be sent between 9:00 AM and 6:00 PM in the destination number's time zone. I would like more information about Remindercall.com. Already using a scheduler? Our engineers will create a custom integration for you. You can customize the script, voice, language, key presses, delivery behavior and schedule. 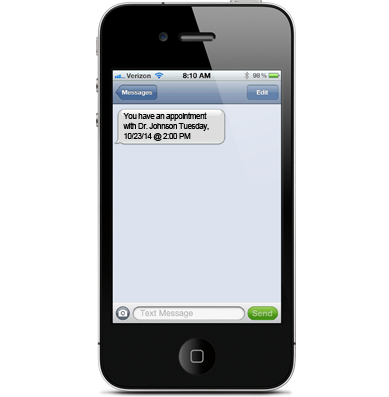 See appointment confirmations as your customers respond. ReminderCall.com uses SSL encryption, and is PCI and HIPAA compliant. We will set up your system so you don’t have to. Live, senior-level support is included with all of our services. If you see 10 customers per day, reminders cost less than a dollar. Pay as you go, there are no contracts! Remember, we create a custom solution for your business... for free! Start 30-Day Trial for Just $1! Congratulations, you've sent a Reminder! Please allow a few minutes for your message to be delivered by your telephone carrier.